Classic vehicles: Vehicles manufactured in 1975 or prior. Newer automobiles: Vehicles manufactured in the last six years. Diesel powered: 1997 or older, or 14,000lbs or greater GVWR rating. Natural gas vehicles: 14,000lbs or greater GVWR rating. The cost of a smog check in California varies based on your vehicle and exactly where you live. You can expect to pay anywhere from $29.95 to $69.95 to get yours done. This fee might not include the $8.25 cost for your smog certificate. Keep in mind, you have to pay even if your vehicle is exempt. For newer vehicles (six or less years old), a $20 abatement fee is due each year to avoid the smog check. For classic vehicles (1975 and older), a $200 abatement fee will apply. Owners of older vehicles are recommended to try and pass the test first and use the abatement fee as a last resort, since passing would be much cheaper. This fee does not apply for diesel vehicles from 1998 or newer, specially constructed vehicles from 1976 or newer or nonresident vehicles. During a smog check, your vehicle will be inspected for its emissions and a visual and functional inspection will also be performed. During the emissions test, measures will be taken to see how much CO, CO2, HC, O2 and NOx your vehicle emits. The physical inspection will look at whether your vehicle, and its exhaust system, works to limit emissions. You can visit a STAR station, a testing location or a testing and repair location. For vehicles with higher levels of emissions, it’s recommended you go to a STAR certified station. If you live in an Enhanced area, you must go to a STAR station. Some of these places will just do the test, while others also handle repairs. When visiting a testing location, make sure to bring your driver’s license, proof of insurance, vehicle title and registration. OBDI Test – the on-board diagnostics test measures data provided via your vehicle’s computerized diagnostics system. This test is applied for any vehicle from 2000 and up. The measurements received are registered and provided to the Bureau of Automotive Repair. From here, if you pass, you can get your smog certificate. The results can also be pulled by a STAR certified repair shop if you fail and need to determine what needs done to fix your vehicle’s issues. Your vehicle cannot be driven with a failed smog check. You must get the repairs needed to make your vehicle pass the test. A diagnosis will be completed to determine why your vehicle failed. After the repairs are done, another test will be performed to see if the repairs brought your vehicle up to standard. Did your vehicle fail the smog check? If so, you will need to get the required repairs so you can retest and make it road-legal. These repairs could be costly, depending on what you need done. For example, some older vehicles were made with catalytic converters that automatically cause a failed result and replacing this part can cost $750 to $1,500 or more. Thankfully, low income individuals can qualify for some financial assistance. CAP (Consumer Assistance Program) is offered through the California Bureau of Automotive Repair. This repair program provides as much as $500 toward emissions-related repairs if your vehicle does fail the smog check. For more info, view the program page on the bureau’s website. A current smog check certificate must be provided upon completion of a private sale. This certificate must be no more than 90 days old. The only exception here is when your vehicle is no more than four years old. If the model year is this year or no more than three years back, the smog check will not be required. However, this does not apply for diesel vehicles. Remember that the new owner (the buyer) must also pay the $8 smog transfer fee. As of January 1, 2013, California vehicle owners are required to perform the smog check at a recognized STAR testing location. Some STAR-certified shops will only perform the test or repairs, while others do both. Certain stations also handle the BAR-OIS and BAR-97 inspections. For low income individuals, these stations qualify for repair subsidy through the Consumer Assistance Program. Check our full list of smog check stations by choosing a location on our ‘Emissions Testing Near me’ page. Are you a resident in El Dorado, San Diego, Placer, San Bernardino, Sonoma or Riverside? If you live in any of those counties use the zip code checker to see if your vehicle needs to pass a smog check. These counties have different criteria based on where you live. Approximately 350,000 people call Anaheim home. This city is also host to nearly 50 STAR testing and repair locations. Visit our ‘Anaheim Smog Check Stations’ page to find a list of all the STAR certified stations in Anaheim. Maryland – General Emissions Information – There are many commonly asked questions concerning the Maryland emissions program. In this section we will look at the most frequently asked questions concerning Maryland’s emissions inspection program and provide the answers to them. How will I know if my vehicle needs to get its Maryland emissions inspection done? Maryland’s Motor Vehicle Administration will send a letter to you approximately 8 weeks before your vehicle’s deadline to have emissions testing is. You can have your vehicle’s emissions tested anytime after receiving the letter up to the full 8 weeks until the deadline. What if I forget the letter sent to me from the MVA? If you forget to bring your letter that you received telling you that your emissions needs to be tested you will need to provide your registration in its place when go to get the emissions inspection done. Is there a fee to have my emissions tested in Maryland? Yes, there is a $14 fee to have a Maryland emissions inspection performed. There are multiple forms of payment accepted: credit card, money order, cash, or personal check (you will need two valid forms of ID if you wish to pay by personal check). When will I find out if my vehicle passed or failed the emissions inspection? After the emissions inspection is performed you will be given an emissions paper that tells you whether your vehicle passed or failed the Maryland emissions inspection. In the event that your vehicle failed the emissions test the paper will inform you of when your emissions retest will be. Do I need to pay for a retest if my vehicle failed the initial emissions inspection? No, you do not need to pay for the retest. The retest is done for free. If I cannot get my vehicle tested by the due date am I able to get an extension? You can request an extension by calling 1-800-638-8347 and explaining your situation. Maine Emissions Failures Retests – There is a chance that when your bring your vehicle in for its Maine emissions inspection that your vehicle may fail the test. If your vehicle fails the emissions test there are a few steps you will need to follow. Upon emissions testing failure in Maine, you will have sixty days from the test date to have your vehicle repaired and have an emissions retest performed and passed. If you do not comply with this you risk receiving a citation or possibly having your registration suspended. If you go to have a retest done and you are within the sixty days limit the retest will be performed free of charge. It is recommended that for repairs you go to a qualified technician that has the proper diagnostic and repair equipment. Most dealerships and repair shops should have the required equipment but you should ask prior to bringing your vehicle there to ensure they are qualified. If your vehicle failed the emissions test you are not supposed to drive your vehicle until the repairs have been made. If your vehicle was manufactured in 1996 or later, following having your repairs made on the vehicle you will need to drive the vehicle for one week so that your Onboard Diagnostics can collect the required amount of data for a retest to be performed. Illinois General Emissions Information – There are many questions concerning the state of Illinois emissions testing program. Below you will find some of the most frequently asked questions and their answers concerning the Illinois emissions inspection program. Which vehicles need to get tested for emissions? The vehicle powered by diesel fuel or 100% powered by electricity. Vehicles manufactured in 1967 or prior. If your vehicle was manufactured in 1995 or prior that was compliant with the February 1, 2007 Illinois Vehicles Emissions Inspection Law. If your vehicle is registered in another state and is compliant with the emissions program law in that state. What kind of test is done during an emissions test? The emissions test consists of an On-Board Diagnostic test. This test checks a computer data log that is stored in your car which identifies if there are any issues with your engine causing a greater amount of emissions to be produced than is legal. How often does my vehicle need to be tested? Emissions testing is required every two years on your vehicle. Is emissions testing required on heavy duty vehicles? If your vehicle weighs between 8,501 and 14,000 pounds and was manufactured in 2007 or later than an emissions test is required in Illinois. What is an exhaust and gas cap test? This is a test performed on vehicles that were manufactured prior to 1996. Vehicles manufactured in 1996 or later are given the ODB test. The reason for this is that it was a requirement that began in 1996 that vehicles must be equipped with a standardized ODB system for emissions testing purposes. There are general questions concerning the Arizona emissions testing program that people have. This section will attempt to answer some of the most frequently asked questions and provide tips on Arizona emissions policies. Can I have a passenger or pet in the car during emissions testing? No, you should not bring any passenger or pet in your vehicle when you bring your vehicle for emissions testing. You will be required to exit the vehicle during emissions testing or you will need to move to the passenger seat. No other person and no pet is allowed in the car during emissions testing. All vehicles must be able to enter the emissions inspection station on their own power. If you have any trailers or attachments on the back of your vehicle you will need to remove them prior to testing. Can I get my emissions tested if my check engine light is on? If your vehicle is from 1996 or is newer and has OBD equipment you will not pass the emissions testing procedure if your check engine light is on. You should have your vehicle repaired prior to testing. How much are the fees for emissions testing in Arizona? The fees vary depending on location and type of vehicle. In the Tuscon area all vehicles are $12.25 to get the emissions testing done. In the Phoenix area if your vehicle is 1981 or newer and under 8,500 pounds the fee is $27.75. Heavy duty diesel vehicles which weight more than 8,500 pounds are assessed a $28 fee for emissions testing, and most other vehicles are $19. What happens if I live outside of the emissions test area but I received an Emissions Required notice? You can print out an emissions exemption form found here and submit it. There are many commonly asked questions concerning Washington DC emissions laws and testing policies. Here we will cover these frequently asked questions and their answers in order to help you find the information you are looking for concerning Washington DC emissions. How do I go about having my vehicle inspected for the first time? In Washington DC it is required for residents to have their vehicles tested for emissions prior to being able to have their vehicle registered. Brand new vehicles that have a MCO and are non-commercial use are waived from needing an emissions test initially. How much does it cost to get the vehicle emissions testing inspection done? The emissions testing inspection fee is $35 and the test results are valid for two years. Is there a late fee assessed if I get testing done after my due date? Yes, there is a $20 fee assessed for every 30 days you are late. This fee will be capped at $480. Am I able to make an appointment ahead of time to get my vehicle’s emissions tested? You are able to use an online scheduling service which is available 24 hours per day. You can access that scheduling service here if you want to set up your appointment for your emissions test. When and how do I pay for the emissions testing fee? The fees for your vehicle’s emissions testing are due at the time of registration and registration renewal of your vehicle. It is possible that depending on your registration date you have already paid the fee for the inspection or you may need to pay it when your next renewal arrives. The inspection fee you pay includes 2 re-inspections for free if your vehicle requires them. They must occur within the 20 day period after you initially fail the test. How long is the wait to get my vehicle emissions tested? The wait time varies on a day to day basis. Vehicles are tested on a first come first serve basis. If you scheduled your appointment online you will get to move past the inspection station gates and go directly into the que for the inspection station lane. 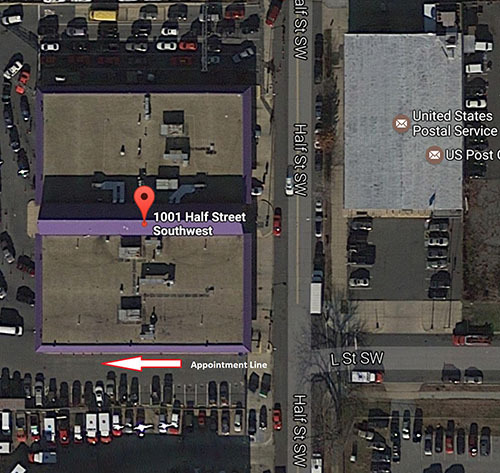 In Washington DC you can get your car emissions test at the main inspection location for the area. The main DC vehicle inspection station is located at 1001 Half Street, SW and car emissions test can be done from Tuesday to Saturday. You should first check the hours and schedule before going to the location since the station operates at different hours for the summer and winter seasons. For the District of Columbia, taking the emissions test is an obligatory requirement for all vehicles. If you have just moved to DC, if you have purchased a new vehicle that has an expired inspection sticker, or if your current car’s sticker is about to expire, it is compulsory to take the emissions test. Depending on the type of vehicle and its intended use, the fees at the DC DMV inspection station can vary. These fees are calculated with the registration fees and also cover two free re-inspections should your car fail the testing. If the vehicle fails the emissions test, the new inspection must be done within 20 days. If the retesting is done after 20 days, the fee for the test will be $35. For private, commercial and for-hire vehicles, the inspection fee is also $35 dollars. For both new vehicle sticker and replacement inspection sticker, the fee is $10. There are also fees for failing to complete the emissions test on time. For every 30 days, the fee is $20 and is accumulated up to $480 maximum. The DC DMV inspection station does not accept cash as a payment option. The fees and services can be paid for by check, credit or debit cards and money order. The fees are paid at the time of vehicle registration, not at the station. This DC inspection station is wheelchair accessible and it offers free limited on-site parking. The inspections are usually carried out on a first come – first serve basis, but there are certain exceptions to the rule. The location offers the possibility of scheduling the appointment online. Online scheduling is available for all commercial and non-commercial vehicles, as well as for taxis and limos. If you make a scheduled appointment online, you will be queued into the inspection lane right away. Another important exception to the rule are senior citizens. Senior citizens are to proceed to the front of the line and they need to make sure that the station employee knows that they are a senior citizen. The wait times for DC vehicle inspection can vary depending on the day of the week and the time of the day. The usual recommendation is to avoid taking your car for the testing on Tuesdays and the first day after the holiday. When it comes to the busiest hours, the first hour of opening and lunch times (10 am-1 pm) are usually the busiest. The best times to come for a test are on Thursday or Friday from 8:30 am to 10 am and from 1:30 pm to 3 pm. Although the online appointment is not compulsory, it is recommended to make one in order to avoid longer wait. For more details please check the Washington DC emissions testing hours and schedule. Certain online services are only available after you visit the DMV inspection station. It is important to note that the registration renewal can now only be done online. The safety inspection for private passenger vehicles is not required by the DMV. Taxis, limos and other commercial vehicles are required to take both emissions and safety inspections. Inspection fees and fines are to be paid when the vehicle registration is due, not at the testing station. As an industry standard, the mileage of the vehicle will be recorded and rounded down to the nearest thousand. If the inspection sticker displays “Void“, you need to proceed to get the sticker replacement at the station. The sticker replacement fee applies. Vehicles with malfunctions that produce excessive amounts of smoke cannot be inspected. Each state has an area specific requirements and testing guidelines. For the full DC vehicle inspection info about the requirements, failures, and retests, please visit Washington DC – General Emissions Information and Washington DC – Emissions Testing Failures & Retests pages. Please make sure you follow the rules and requirement carefully in order to avoid unnecessary costs, shorten wait time and successfully renew your car’s registration. You can also read some of the tips and tricks that can help you prepare your vehicle for the inspection. There are many Illinois Emissions Testing locations where you can get your Illinois emissions test performed. Below is a list of many stations that do emissions testing throughout Illinois. It is always recommended that you call ahead to check on wait times, schedule an appointment if necessary, and ensure that the station is still performing emissions testing. Here are local businesses which also can perform emissions testing for you on your vehicle. 1000 E. Chain of Rocks Rd. There are many common questions that residents of Indiana have about the state’s emissions testing program and requirements to pass the Indiana emissions inspection. This section will look at the most frequently asked questions and their answers concerning the Indiana emissions testing program. How often does my vehicle need to be brought in for emissions testing? In Indiana, emissions testing is required every two years. If your vehicle was manufactured in the last four years it is exempt from requiring emissions testing until it is five years old. Emissions testing in Indiana is done on an odd year/even year basis, meaning if your vehicle was manufactured in a year ending with an odd digit (such as 1997) you will need emissions testing to be done on odds years (such as 2013, 2015, 2017), and if your vehicle was manufactured on a year ending in an even digit your vehicle will need to get emissions testing done in years ending on an even digit. When will I need to get my vehicle’s emissions tested? In order for you to renew your registration in Indiana you will need to have your vehicle pass the Indiana emissions inspection. How will I know if I have an emissions test that I need to complete? You will be notified if you live in Lake and Porter counties by the Indiana Department of Motor Vehicles when you have an emissions test due. Indiana will send this notice out to you about two months prior to the due date of the emissions test. Do I need to wait for the emissions testing notice in order to have my vehicle’s emissions tested? No, you can have your emissions tested earlier if you wish. Vehicles can have emissions testing done as early as October of the year prior the due date. Is there a customer service number or email if I need to contact someone from Indiana’s Clearn Air Car Check program? Yes, you can call toll free 888-240-1684 or you can send an email to indiana@esph.com if you would like to reach someone to speak with.